VFL: Round 18 in 60 seconds Get a snapshot of the VFL Magpies' clash with North Ballarat in 60 seconds with Collingwood Media. 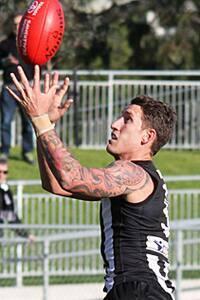 Jesse White kicked three first-half goals as the VFL Magpies were defeated by North Ballarat. Photo: Shane Barrie. An in-form North Ballarat has handed the VFL Magpies its first home loss for the season at Victoria Park on Saturday afternoon. The Roosters defied their inferior ladder position and Collingwood’s strong home ground advantag, to win by eight points in an exciting, high scoring game. The Magpies controlled large stages of the game and led at half time by 22 points and by 25 points at three quarter time. Yet coach Dale Tapping told Collingwood Media post match that North Ballarat posed a constant threat. “It was a real struggle for us all day,” Tapping said. “They had some good additions in from their North Melbourne side. But we had a pretty reasonable outfit in too. While for North Ballarat these additions included Daniel Wells and best-on-ground Ryan Bastinac, it was former Western Bulldog Andrew Hooper who posed the most dangerous threat. Hooper shook the tag of Jesse Wallin to kick five goals, including two crucial majors in the final term to put the Roosters in a winning position. At the other end of the ground, Jesse White produced another strong performance and finished with three goals. After flying to Sydney with the AFL team on Friday night, White kicked two behinds in the first quarter before finishing with three goals. Tapping praised the intensity of White, describing the key forward’s form as “promising”. “I thought Jesse White worked really, really hard,” Tapping said. “He was probably one of our guys in the first quarter who was playing the way we needed to play. Despite North Ballarat’s ability to limit opposition scoring, both sides traded goals in an open, free-flowing first quarter. All eyes were on returning Brent Macaffer in the second term, as the midfielder took the field for the first time in his first game back from a ruptured ACL. Having not played since August last year, Macaffer won a clearance within seconds of coming onto the ground and appeared comfortable during his three quarters of game time. Despite his influence, the Magpies were helpless against a dominant North Ballarat in the final quarter. The Roosters kicked seven goals to one and had 47 more disposals than their highly-favoured opponents as they claimed their second victory over Collingwood this year. The loss, in addition to Footscray’s narrow defeat of Port Melbourne on Saturday, means the Magpies now face an uphill battle in the bid to secure a top four finish. While Tapping believes the Magpies can be successful regardless of claiming a top four position, he expressed that the current focus remains centred on improving the teams form before the finals series. “It doesn’t mean you can’t get to where you need to go. It just makes it a little easier if you have that double chance and the opportunity,” Tapping said. Collingwood will return to Victoria Park next Saturday to take on thirteen-placed Richmond.